TRichView was used in Skype chat window and in some other places. New versions of Skype use their own text editing components instead of TRichView. Skype is a little software that enables you to make free calls anywhere in the world. Skype uses innovative P2P (peer-to-peer) technology to connect you with other Skype callers. Skype calls have better sound quality than your regular phone and are highly secure, with end-to-end encryption. Skype requires no additional equipment, besides a normal PC microphone or a headset. 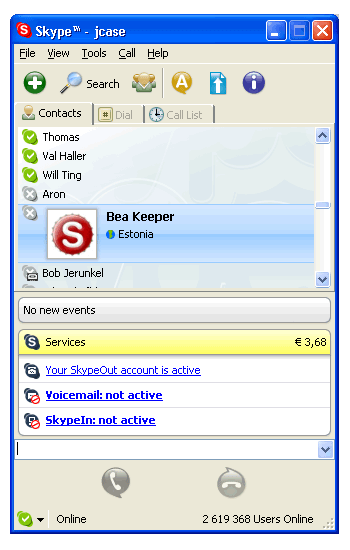 Calling mobiles or traditional phones with Skype is not free, but pretty cheap using SkypeOut. Skype for Windows v1.3 incorporates feature improvements, including enhancements for importing new contacts to contact list, as well as a more customizable user profile area. Skype v1.3 allows users to populate their Skype contact lists from a growing number of desktop applications including MSN, and auto-populate exact matches from Microsoft Outlook. Skype for Windows also offers an enhanced visual experience with streamlined user interfaces and improved notices about client upgrades and premium services. New animated emoticons give instant messages more expression.